Heavy metal is one of popular music’s most enduring and commercially successful genres. Emerging in the late 1960s, metal has since undergone numerous transformations, from massive arena spectacles to obscure underground subgenres. Despite its longevity and sustained popularity over the past four decades, metal has enjoyed only limited scholarly attention. It was not until the early 1990s — over 20 years after the genre’s inception — that a significant body of scholarship began to emerge. But even then, the critical literature on metal has remained noticeably less than for other major musical genres and, significantly, it has also remained noticeably less favourable. Metal has been too often dismissed as conservative and reactionary; its apparent substitution of escapism for political commitment has contributed to a dominant stereotype of the genre as less empowering, less culturally significant and less worthy of study than other more straightforwardly ‘progressive’ alternatives. Heavy Metal: The Music and its Culture in 2000). Apart from the recent Metallica and Philosophy: A Crash Course in Brain Surgery (2007), published as part of Blackwell’s ‘Philosophy and Popular Culture’ series, there has not been an edited collection on heavy metal music. Heavy Metal Music in Britain is therefore a welcome — and overdue — contribution to this neglected area of scholarship. The collection features ten essays exploring heavy metal from its emergence in England’s industrial midlands to the NWOBHM (New Wave of British Heavy Metal) to its internationalisation in the late 1980s. Many of the contributions feature discussion of what might be called the ‘usual suspects’ of British heavy metal — Led Zeppelin, Black Sabbath, Judas Priest, Iron Maiden, Motörhead — but there is also interesting discussion of some lesser known bands more closely associated with the extreme metal scene, such as Carcass, Napalm Death, Bolt Thrower and Cathedral. Heavy Metal in Britain is divided in three parts: Metal Commodities’, ‘The Literary and Mythological Heritage’ and ‘Heavy Metal Societies’. In addition, it includes an Introduction written by editor Gerd Bayer and a good select bibliography. Bayer’s Introduction speaks to the critical neglect of heavy metal, and outlines one of the key aims of the book: to contribute to a “greater presence of heavy metal in cultural studies” (p. 2). This would certainly be a welcome result of a collection such as this, but unfortunately Bayer’s desire to expand metal studies as a field leads him to evaluate current work in the area in largely uncritical terms. In doing so, the Introduction problematically conflates scholarly and non-scholarly work, and celebrates rather indiscriminately what existing scholarly work there is. Lords of Chaos (1998) and Christe’s Sound of the Beast (2003) as two key studies. Lords of Chaos is a salacious account of murder and church burnings in the Norwegian black metal scene by music journalists Michael Moynihan and Didrik Søderlind. Sound of the Beast is journalistic history of key metal artists and genres. Both are interesting books and are of relevance to the heavy metal researcher, but to describe such accounts as ‘scholarship’ will do little to increase the legitimacy of heavy metal within cultural studies. In The Houses of the Holy: Led Zeppelin and the Power of Rock Music (2003) — an oversight given the Zeppelin-centredness of much of the analysis that follows. If heavy metal is indeed to have a greater presence in cultural studies, it is essential that work in this field be at least as rigorous as studies of other major musical genres. Uncritical scholarship does not do metal studies any favours. That being said, there is much interesting work in this collection that attempts to step outside of what have become some of the conventional ‘orthodoxies’ of much existing metal scholarship. Her analysis of British heavy metal, in contrast, suggests a more nuanced analysis of heavy metal values (insights, I think, that apply equally well to much of the heavy metal discussed in her earlier book). For Weinstein, the “master signifier” of heavy metal is not gender, but power (p. 27). This is power understood largely in masculine terms, but the interpretation of masculinity is one that is “free standing” and not based on a hierarchical male/female binary (p. 28). Thus British heavy metal is masculine, but it is not necessarily masculinist. This more complex understanding of meaning and identity in the metal subculture opens up space for more productive readings of metal’s gendered performance than have characterised much of the scholarship to date. In the same section, Liam Dee’s article on grindcore applies Adorno’s theory of negative dialectics and Kristeva’s theory of abjection to an analysis of late 1980s extreme metal. He reads the music of bands such as Carcass and Napalm Death in terms of socio-political abjection and social critique, arguing, for instance, that Carcass’s fascination with cannibalism and corporeal disintegration be read as part of a vegetarian critique. Importantly, though, Dee also considers extreme subject matter as sites for comedy and play, suggesting that the subgenre offers listeners a “jouissance of fun” (p. 66). Given that many existing accounts of extreme metal prioritise political questions over questions of listening pleasure, this study goes some way to redressing this imbalance. Part 2 considers the literary and mythological heritage of heavy metal, including Satanism/occultism (Helen Farley), dystopianism (Laura Wiebe Taylor), classical allusion (Iain Campbell), and the Gothic (Bryan A. Bardine). Of the four essays, Taylor’s is the most interesting; it links the apocalyptic imagery in heavy metal music with the dystopian literary tradition of social critique, and suggests that there is something empowering and affirming — utopian, even — about this imagery, which has often been read as a straightforwardly coded nihilism by other critics. this form? Why is Satanic and occultic imagery important to heavy metal? Understanding the absence of organised working class resistance in British heavy metal is an important step in understanding the genre’s complexities and contradictions; the audience cannot simply be dismissed as conservative, reactionary or duped. Part 3 includes a further two explorations of the politics of heavy metal. Magnus Nilsson considers heavy metal’s positive revaluation of working class masculinity via an analysis of the lyrics of Motörhead. 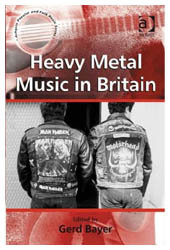 The book concludes with Bayer’s examination of post-national tendencies in more recent British metal, including the work of Motörhead, who he reads as indicative of a larger shift “away from a national context of political investment and toward a transnational focus on globalisation” (p. 190). Heavy Metal Music in Britain nonetheless opens up some new ways of thinking about metal that go beyond the simplistic stereotypes that have characterised much existing scholarship (such as the notion that heavy metal is monolithically sexist and reactionary). In doing so, the contributions introduce some productive areas of analysis that will hopefully contribute to the growth and development of the field of metal studies.